The active duty and National Guard missions are estimated to cost $682 million. About 3,500 additional active duty U.S. service members will deploy to the southern border, according to House Armed Services Committee Chairman Adam Smith, a Washington State Democrat, who on Thursday sharply criticized top Pentagon officials for not disclosing the figure during a hearing earlier in the week. The troops are expected to deploy around mid-February, and many will be used to build and reinforce about 160 miles of concertina wire, a U.S. official said. The 3,500 figure is higher than a previous estimate of 2,000 additional troops reported by ABC News on Wednesday. At a Pentagon news conference on Tuesday, Acting Defense Secretary Patrick Shanahan told reporters "several thousand" more troops would head to the U.S.-Mexico border, joining about 2,350 already deployed across Texas, Arizona and California. Two top Department of Defense officials testified before the House Armed Services Committee on Tuesday, but did not disclose the 3,500 troop increase, a decision Smith said "deeply troubled" him. "[The witnesses] never mentioned it, despite the fact that the Secretary of Defense was revealing an increase in personnel that same day. This was at best an error in judgment, and at worst flat-out dishonesty," Smith said in the statement on Thursday. The chairman said he has since spoken with Shanahan for more details about the troop increase, but that phone call was "not a substitute for transparency before Congress and public candor." Defense Department officials did not immediately respond to an ABC News request for comment. (Sgt. Brandon Banzhaf/U.S. 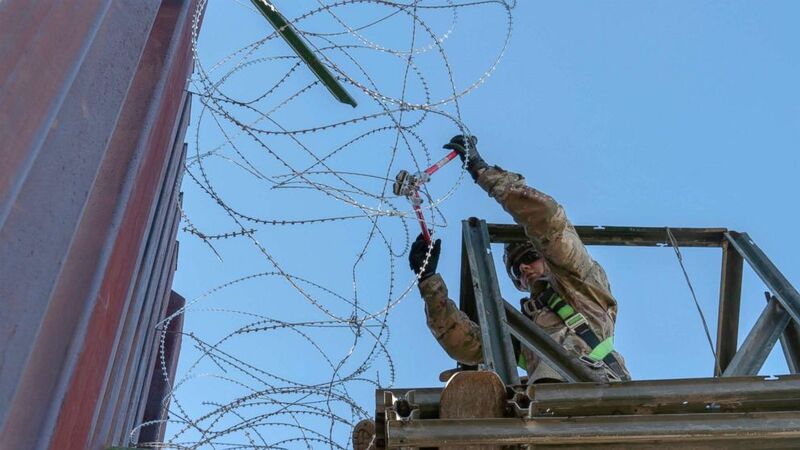 Army) A Soldier with the 515th Sapper Company, 5th Engineer Battalion, 36th Engineer Brigade, cuts off loose strands of concertina wire along the border infrastructure near the DeConcini Port of Entry, Dec. 19, 2018, in Nogales, Arizona. The additional forces will bring the total number of troops to just under 6,000, but that number will be temporary as some units are expected to return to their bases, the official said. At the mission's peak in December, about 5,900 service members were deployed. There are also about 2,200 National Guard troops who have been serving on the southern border since last April. On Thursday, Trump tweeted that more troops were deploying "to stop the attempted Invasion of Illegals, through large Caravans, into our Country," adding that a wall would make it "easier" and "less expensive" to stop the migrants. The additional concertina wire that troops will build and reinforce is part of the latest Department of Homeland Security request to the Pentagon for additional support, which was approved by Shanahan earlier this month. Since the fall, military engineers have already built approximately 70 miles of wire obstacles and placed movable barriers at 22 ports of entry in Texas, Arizona and California, according to the Department of Defense. (Lance Cpl. Betzabeth Galvan/U.S. Marine Corps) U.S. 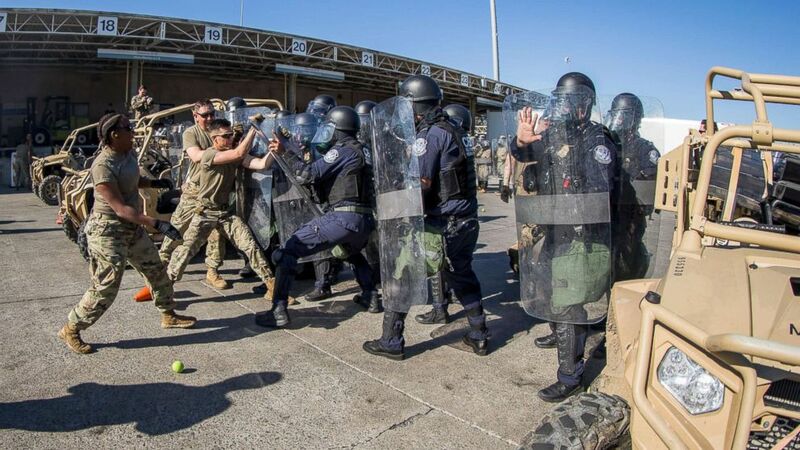 Soldiers with 93rd Military Police Battalion, Special Purpose Marine Air-Ground Task Force 7, simulate resistance during civil disturbance training with U.S. Customs and Border Protection (CBP) at the Otay Mesa Port of Entry, Dec. 16, 2018. At a House Armed Services Committee hearing on Tuesday, Navy Vice Adm. Michael Gilday, the Joint Staff's director of operations, acknowledged the Guard mission from last April through the end of September was estimated to cost $550 million, while the active duty deployment from this fall through the end of January was about $132 million. “This support is now transitioning to the operation of mobile surveillance cameras in support of [Customs and Border Protection (CBP)] and all nine border patrol sectors across four states. And the emplacement of concertina wire on existing barriers at areas designated by CBP between ports of entry in Arizona and in California," Gilday told the committee. ABC News' Luis Martinez contributed to this report from the Pentagon.